MIRI: The government plans to construct overtaking lanes along the Pan Borneo Highway and upgrade the Miri-Bintulu coastal road in stages. Sibuti MP Ahmad Lai Bujang told The Borneo Post yesterday that this could be considered good news as it would smoothen traffic flow and, hopefully, minimise road accidents. He added that he had also proposed to the federal government to widen the roads because at present an accident or vehicle breakdown would result in traffic congestion. Ahmad Lai also spoke of the need for the authorities concerned to give priority to the upgrading of damaged and dangerous road stretches along the Pan Borneo Highway. 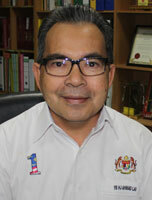 On the Miri-Bintulu coastal road, Ahmad Lai said it needed to be upgraded as it was very prone to accidents. He said most of the accidents which occurred there were mostly due to uneven or sinking roads. Ahmad Lai also urged the police and the Road Transportation Department (RTD) to take stern action against lorry drivers who parked at the sides of narrow roads for they pose a danger to all vehicles, especially small ones. It is understood that the government has allocated RM423 million for the upgrading of the Pan Borneo Highway, which spanned 2,230km from Sarawak right up to Sabah. This includes RM100 million for the construction of overtaking lanes.